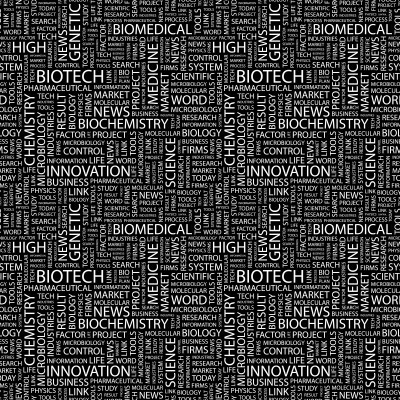 This is the third in a series of posts about keywords for your blog. In the first post, Keywords for Your Blog- A Realistic Approach, I talked about how keywords are important for bloggers, but they are not the end-all that they are for niche marketers. 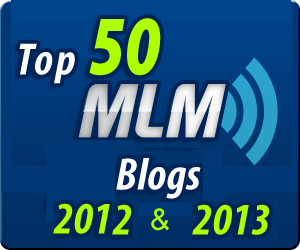 Bloggers provide useful information to a niche group. Niche marketers hammer a few pages with backlinks to rank on a very few keywords. 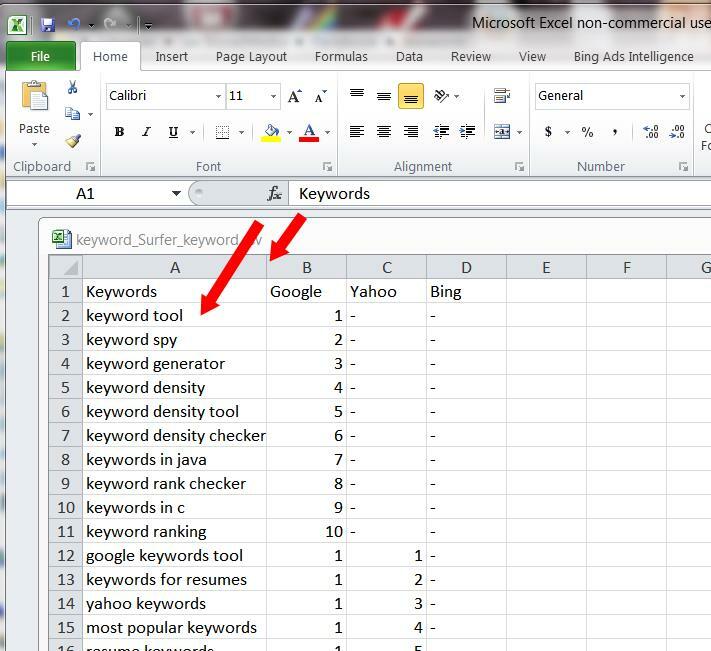 In the second post, I talked about Keywords for You Blog – Create a Massive List of potential keywords. Now we are going start to pare the list down to something you can use. We are going to use Market Samurai here. This tools is well known and does cost $97. You can download it and try it for free for 12 days. What most do not know is that the Keyword Research Module is FREE forever. It continues even after your trial period has expired. The first step is to create a new project. Enter your keys words and then click on the Create button. You can leave the rest alone. On the next screen you select the Keyword Research Module. TEACHING TIP: Market Samurai costs about $100. They give you a 12 day free trial. The Keyword Research module is free forever. The first time you use this module, it will ask for you Google Adwords Account information. 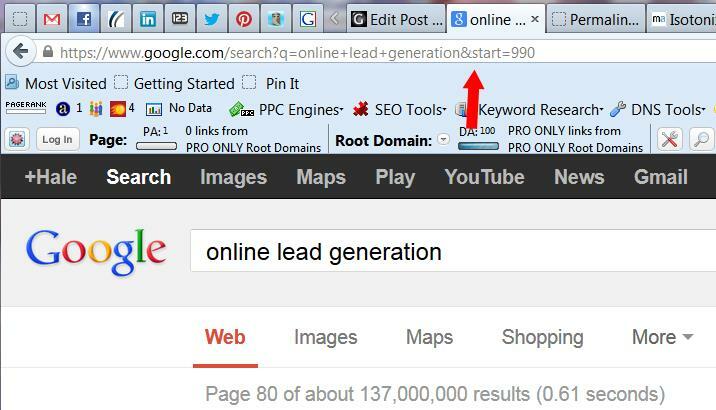 It needs this information to get the best results from the Google Keywords Tool. 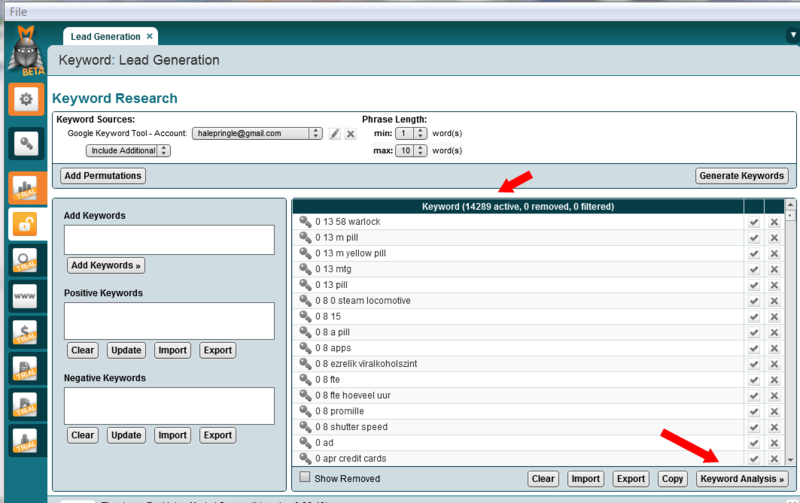 The Keyword Research screen is where we enter our lists of keywords. Market Samurai will automatically remove the duplicates. It will also remove the broad, phrase and exact versions leaving just one unique long tailed keyword per line. We are going to copy and paste keywords into the box on the left indicated by the red arrow. These words will move to the right column and the count will increase after you press the “Add Keywords” button. This is how the spreadsheet looks when you start. After the CTRL-A (and dragging the right side of the first column – in the header line – to the right to make it wider) the screen looks like this. After the Shift-Left Arrow presses, you end up with just one column highlighted. CTRL-C to copy the column and change to the Market Samurai screen. Paste them into the box on the left and then press the “Add Keywords” button. Then you need to CRTL-A and Delete to clear the box for the next set. Rinse and Repeat until you have entered all of your CSV files into Market Samurai. I also do a CTRL-A and DELETE to clear the “Add Keywords” box above after I have pressed the “Add Keywords” button. 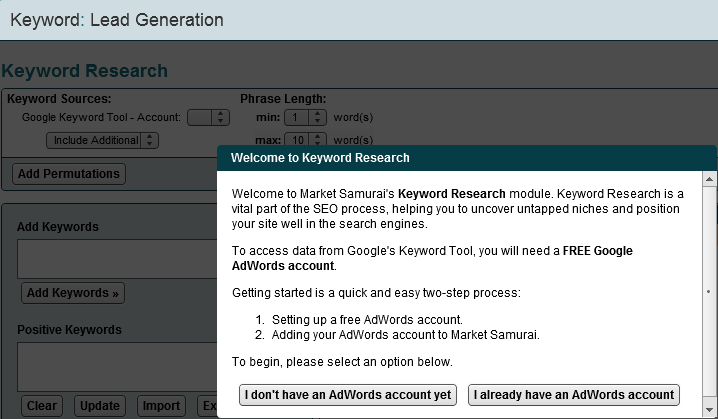 TEACHING TIP: I tried with about 20,000 keywords and Market Samurai never finished. There is a limit. It probably has to do with how much memory your machine has. Just be aware. TEACHING TIP: Competition means different things in different places. It is critical that you understand the difference here. Once you have clicked on the Keyword Analysis Button, you will see the screen below. We do NOT want keywords that have many, many webpages competing for the keyword. We do NOT want keywords that have virtually no one searching for the keyword. As the red arrows below show, I’m asking for at least 30 searches PER DAY and fewer than 60,000 pages to compete with. Then I press the button at the bottom. 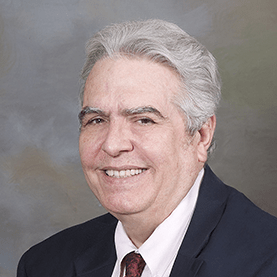 Can I really compete with 60,000 web pages? TEACHING TIP: There are many “duplicate” pages (according to Google) on the Internet. Here is how to tell how many pages you are actually competing against. That is 137,000,000 results. Can I really compete? Note at the top, I have shown you the keywords that were searched for. They are separated by plus signs and have an ampersand after them. Replace everything after the ampersand with “start=990” (Note the lower case.) This is what it looks like. The 137,000,000 still looks the same. However if you scroll down the page, you will see this. Okay. Maybe I can compete against 800.! 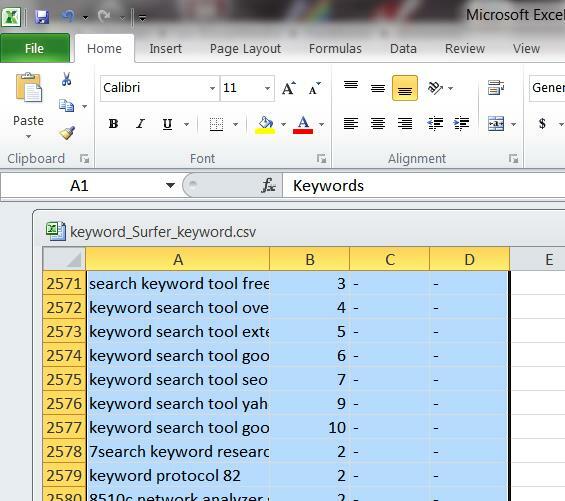 Once you have your keywords entered, it is time to Export them, Save them and start to Analyze them. 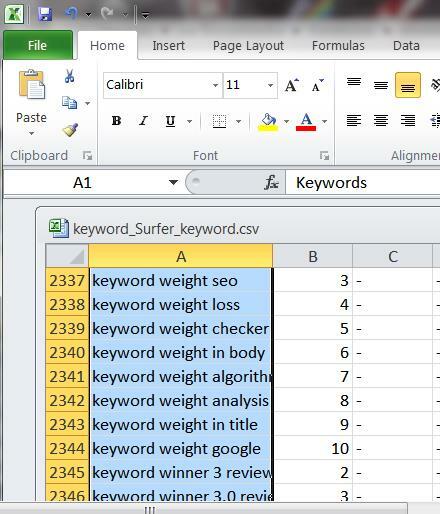 Lets look what the Keyword Analysis Button gives us. This shows that Market Samurai has taken the 20,000 keywords and found that only 1378 actually met the criterion of having at least 30 requests per day and less than 60,000 pages with that keyword on it. There are still quite a few of these that I can’t reasonably compete for. We’ll look at how to find out which one I can compete for in the next post. We are almost there – Finding Keywords for Your Blog That You Can Compete for. discovered this website on the internet. I have received an excellent stuff of information. Many thanks. Excellent article – I Appreciate the info . Does someone know where my business would be able to find a sample a form form to work with ?